Since breaking my wrist, I have not posted to my “A Salad for Each Week” series. Between being limited in my cutting and chopping abilities, my slow pecking – I mean typing!, and just lack of time due to the EXTRA time it took me to do everything else that had to be done, I just couldn’t get to these posts like I wanted to. BUT, it is back! Just a reminder, these salads are ones to make ahead and be able to eat off of for a few days. Embellish and substitute when desired! Whisk oil, lime juice and zest, garlic, S&P, and vinegar in a large bowl. 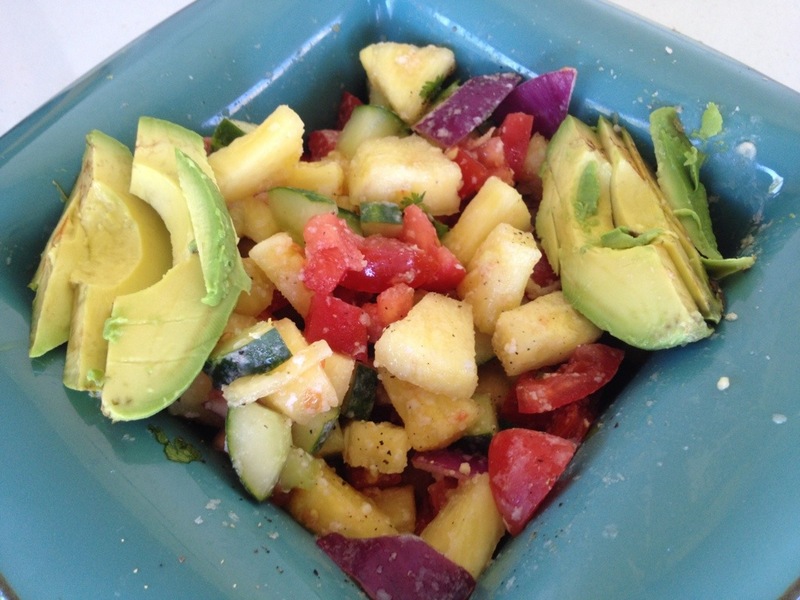 Place chopped pineapple, cucumber, tomato, and onion into bowl. Gently fold fruit and veggies into the dressing. Toss in fresh cilantro and place sliced avocado alongside or on top of salad. Serve alone or on top of crisp, bibb lettuce leaves.